I don't want to access my geoserver behind a proxy. I can access it directly. It is in same network as I with no proxy between us. I have a Geoserver and created some layers consuming WMS services from somewhere. My problem is that my geoserver is behind a proxy. its a governamental institution and all access to external world needs to authenticate do the proxy to go out. I need to configure it in my browser to use the internet, but need an exclusion rule in browser to access internal network (to ignore proxy). 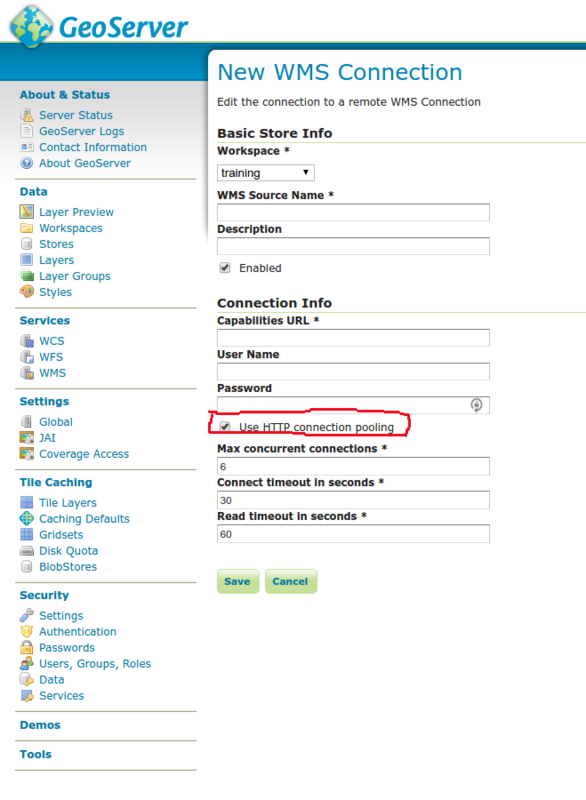 I don't know how to tell Geoserver to login into that proxy to allow it access the outside WMS service I need to consume. You need to set the http proxy variables either using a system environment variable or through a JVM property set in catalina.sh. There are detailed steps on how to do this on the WFS Store page. In the past there have been issues with the HTTP COnnection pooling not picking up the proxy variables so if it continues to not work try unclicking the connection pooling box. Not the answer you're looking for? Browse other questions tagged geoserver proxy or ask your own question.